Yo-ho, yo-ho the treehouse life for me! This pirate-themed treehouse is the swashbuckler’s ultimate secret lair! Our clients, Kelly and Stephanie, pined for a place where they could get out to nature with their three kids and enjoy spending time together. When their kids were younger, this fun-loving couple would design outdoor treasure hunts in order to motivate their kids to go on hikes. 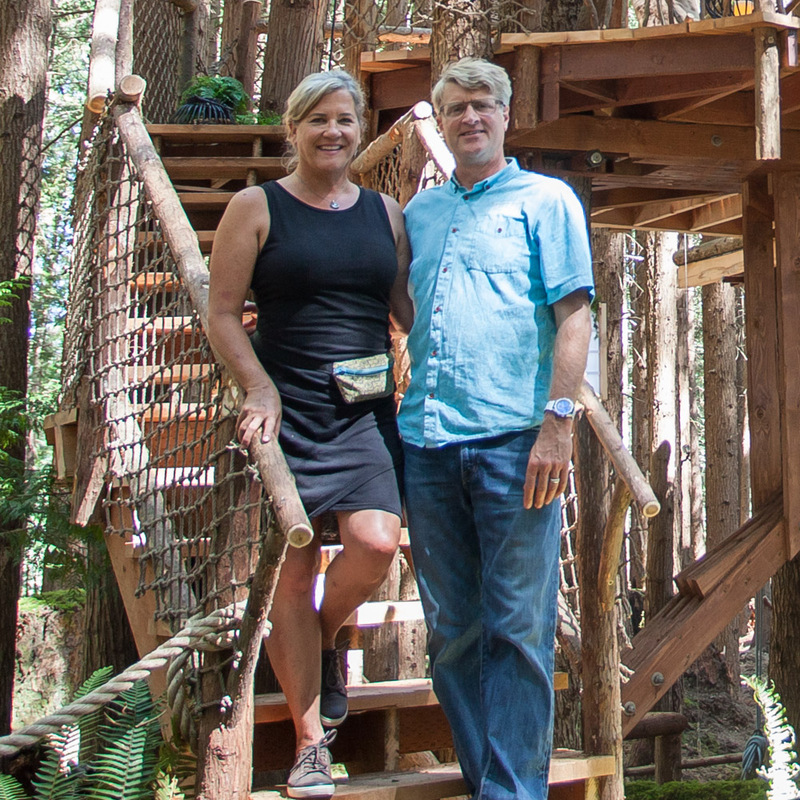 The treasure-hunting spirit has since become an integral part of the family - it's for this reason that Kelly and Stephanie asked Pete to add refined pirate flair to their treehouse retreat. Captain Pete and his mateys had th' best time building this pearl of the forest! To enter, you must walk the plank across a 50-foot suspension bridge leading to a curved deck. Inside, secret compartments create the perfect place to store away stolen treasure. The captain's cabin is outfitted with a lounge, game table, bar, and ship’s ladder to a sleeping loft with a queen-sized bed. Beautifully crafted details (like the curved, stern-inspired loft windows) subtly create the illusion of being out at sea; a sea of trees, that is! Over 50 feet of bouncy suspension bridge leads to the ample deck. Steel cables make sure this bridge will never buckle under the weight of too many mateys. The deck offers views of the lush forest and even a glimpse of the ocean beyond! There's also an outhouse tucked away in a corner of the deck. What's a pirate-themed treehouse without a ship's wheel? Soaring Douglas fir and maple trees host this arboreal pirate hideout. A cutout in the wall near the facade makes it look like tree branches weave through the structure. These twisty branches seem like Kraken tentacles rising from the ocean depths to entwine the treehouse. Natural branch railings give a rustic, rugged vibe to the deck. Inside lies a custom bar. Judy's ready to serve up some grog! The lounge also includes a game table, comfy seating, and radiant floor heating to keep all shipmates cozy and warm. A ship's ladder leads to the bedroom loft. Can you see how part of the bar slab makes up one of the ladder rungs? Pete designed the bedroom to look like a ship's stern. Curved windows and the railing outside add to the stern-like aesthetic. One of the maple trees hosting the treehouse was partially hollow in the center - but this was not a problem for the crew. They installed a six-foot-long, custom steel TAB all the way through the tree, spanning the rot and securing it in the strong "rind" near the edges. This epic hardware allowed the maple to securely hold structural weight. Pete added a trapdoor that leads to a small, hidden treasure chest just below the main floor of the treehouse. The chest has a see-through bottom that enables viewers to admire the prodigious fir log beneath the platform. It's also the perfect place to store precious doubloons! A pulley system allows mateys to easily haul up booty to the treehouse. Aye, this beauty was one of th' crew's favorite builds! Thank ye, Kelly and Stephanie, for a real treasure of a treehouse!